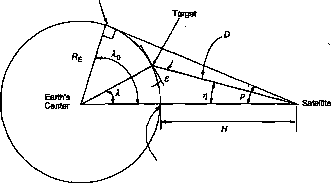 The most common problem in space mission geometry is to determine the relative geometry of objects on the Earth's surface as seen from the spacecraft One example is to use the given coordinates of a target on the Earth to determine its coordinates in the spacecraft field of view. Another is to determine the intercept point on the surface of the Earth corresponding to a given direction in spacecraft coordinates. where RE is the radius of the Earth and if is the altitude of the satellite. Fig. 5-11. Relationship Between Geometry as Viewed from the Spacecraft and from the Center of the Earth. See also Fig. 5-12. We wish to find the angular relationships between a target, P, on the surface of the Earth, and a spacecraft with subsatellite point, SSP, also on the surface of the Earth, as shown in Fig. 5-12. We assume that the subsatellite point's latitude, Latssp and longitude, Longssp, are known. Depending on the application, we wish to solve one of two problems: (1) given the coordinates of a target on the Earth, find its coordinates viewed by the spacecraft, or (2) given the coordinates of a direction relative to the spacecraft, find the coordinates of the intercept on the surface of the Earth. In both cases, we determine the relative angles between SSP and P on the Earth's surface and then transform these angles into spacecraft coordinates. where <P£ < 180 deg if P is east of SSP and 0E> 180 deg if P is west of SSP. Fig. 5-12. 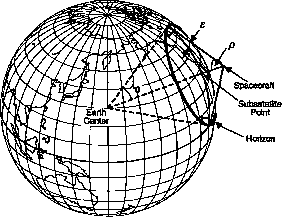 Relationship Between Target and Subsatellite Point on the Earth's Surface. where Latp = 90 deg - Latp and P is east of SSP if <Z>£ < 180 deg and west of SSP if &E > 180 deg. Fig. 5-13. Definition of Angular Relationships Between Satellite, Target, and Earth Center. Figure 5-14 summarizes the process of transforming between spacecraft coordinates and Earth coordinates. Fig. 5-14. Summary of the Process of Transforming Between Spacecraft Viewing Angles and Earth Coordinates. Equation numbers are listed In the figure and variables are as defined in Figs. 5-11 and 5-12.
distance of 3,709 km from the satellite. We will assume a ground station at Hawaii (Latp = 22 deg, Longp = 200 deg) and a subsatellite point at LatSSP =10 deg, Longssp = 185 deg. From Eqs. (5-19) and (5-20), the ground station is a distance A = 18.7 deg from the subsatellite point, and has an azimuth relative to north = 48.3 deg. Using Eqs. (5-25) and (5-28) to transform into spacecraft coordinates, we find that from the spacecraft the target is 56.8 deg up from nadir (rf) at a line of sight distance, D, of2,444 km. From Eq. (5-27), the elevation of the spacecraft as seen from the ground station is 14.5 deg. The substantial foreshortening at the horizon can be seen in that at £ = 14.5 deg we are nearly half way from the horizon to the subsatellite point (A = 18.7 deg vs. 30.2 deg at the horizon). Camera Fran» Shown in (ff) B\ Reld of View of a 35 mm Camera with a Normal Lens Looking Along the East Coast of the US. B". Enlargement of the 35 mm Frame Showing the Region from Georgia to Massachusetts. The rectangle in the upper left of Fig. 5- 15B is the field of view of a 35 mm camera with a 50 mm focal length lens (a normal lens that is neither wide angle nor telephoto). The cameraperson on our spacecraft has photographed Florida and the eastern seaboard of the US to approximately Maine The region seen on the Earth is shown in Fig. 5-15A and 5-15B' and an enlargement of a portion of the photo from Georgia to Maine is shown in Fig. 5-15B". Note the dramatic foreshortening as Long Island and Cape Cod become little more than horizontal lines, even though they are some distance from the horizon. This distortion does not come from the plotting style, but is what the spacecraft sees. We see the same effect standing on a hilltop or a mountain. (In a sense, the spacecraft is simply a very tall mountain.) Most of our angular field of view is taken up by the field or mountain top we are standing on. For our satellite, most of what is seen is the Yucatan and Gulf of Mexico directly below. There is lots of real estate at the horizon, but it appears very compressed. From the spacecraft, 1 can point an antenna at Long Island, but I can not map it We must keep this picture in mind whenever we assess a spacecraft's fields of view or measurement needs. where RE = 6,378 km is the equatorial radius of the Earth. For additional information on the satellite ground trace and coverage, taking into account the rotation of the Earth, see Chap. 8 of Wertz . Fig. 5-16. Path of a Satellite Over the Earth's Surface. A swath which goes from horizon to horizon will cover a very large area, although we will see most of this area at very shallow elevation angles near the horizon. Even for satellites in perfectly circular orbits, the apparent motion of a satellite across the sky for an observer on die Earth's surface is not a simple geometrical figure. If the observer is in the orbit plane, then the apparent path of the satellite will be a great circle going directly overhead. If the observer is somewhat outside of the orbit plane, then the instantaneous orbit will be a large circle in three-dimensional space viewed from somewhat outside the plane of the circle and projected onto the observer's celestial sphere. Because the apparent satellite path is not a simple geometrical figure, it is best computed using a simulation program. Available commercial programs include Satellite Tool Kit (1990), Orbit View and Orbit Workbench (1991), Orbit II Plus (1991), and MicroGLOBE (1990), which generated the figures in this chapter. These programs also work with elliptical orbits, so they are convenient—along with the appropriate formulas from this chapter—for evaluating specific orbit geometry. Unfortunately, a simulation does not provide the desired physical insight into the apparent motion of satellites. Neither does it provide a rapid method of evaluating geometry in a general case, as is most appropriate when first designing a mission. For these problems, we are interested in either bounding or approximating the apparent motion of satellites rather than in computing it precisely. 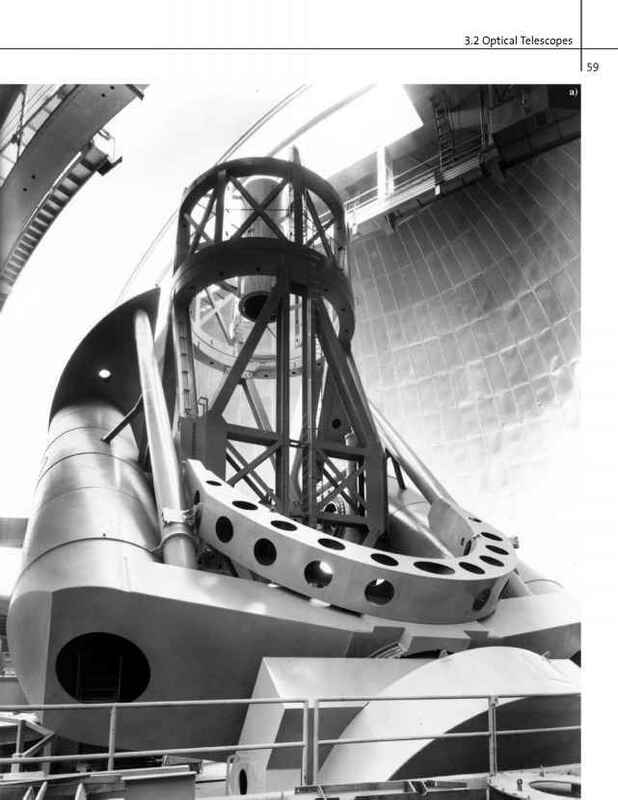 After all, the details of a particular pass will depend greatly on the individual geometrical conditions. Approximate analytic formulas are provided by Wertz [1981,2001]. For mission design, the circular orbit formulas provided below for satellites in low-Earth orbit and geosynchronous orbit work well. We assume a satellite is in a circular low-Earth orbit passing near a target or ground station. We also assume that the orbit is low enough that we can ignore the Earth's rotation in the relatively brief period for which the satellite passes overhead. * We wish to determine the characteristics of the apparent satellite motion as seen from the ground station. Throughout this section we use the notation adopted in Sec. 5.2. Figure 5-17 shows the geometry. The small circle centered on the ground station represents the subsatellite points at which the spacecraft elevation, £, seen by the ground station is greater than some minimum e^. The nature of the communication or observation will determine the value of e^. For communications, the satellite typically must be more than 5 deg above the horizon, so e^ = 5 deg. The size of this circle of accessibility strongly depends on the value of c^,, as emphasized in the discussion ofFig. 5-15. In Fig. 5-17 we have assumed a satellite altitude of 1,000 km. The dashed circle surrounding the ground station is at e^ = 0 deg (that is, the satellite's true outer horizon), and the solid circle represents e^ = 5 deg. In practice we typically select a specific value of e^ and use that number. However, you should remain aware that many of the computed parameters are extremely sensitive to this value. Fig. 5-17. 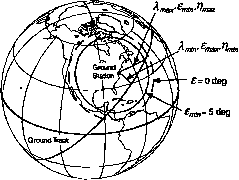 Geometry of Satellite Ground Track Relative to an Observer on the Earth's Surface. * See Chap. 9 of Wertz  for a more accurate approximation which takes the Earth's rotation into account. SI" Timor where p is the angular radius of the Earth as seen from the satellite, that is, sin p = RE/(RE+H). We call the small circle of radius centered on the target the effective horizon, corresponding in our example to = 5 deg, to distinguish it from the true or geometrical horizon for which emin = 0 deg. Whenever the subsateJlite point lies within the effective horizon around die target or ground station, then communications or observations are possible. The duration, T, of this contact and the maximum elevation angle, f^^, of the satellite depends on how close the ground station is to the satellite's ground track on any given orbit pass. Again, the two valid solutions correspond to the northbound and southbound passes. where Vsat is the orbital velocity of the satellite, and P is the orbit period. TABLE 5-4. Summary of Computations for Ground Station Pass Parameters. 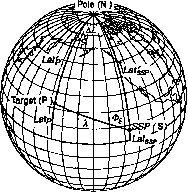 We assume the following parameters: orbit pole at lat^=61.5 deg, long^ = 100 deg; Hawaii ground station at lafo = 22 deg, longgs = 200 deg; minimum allowable elevation angle = 5 deg. The result is a typical pass time-in-view of about 12 min.